Decoy a one-season undercover cop show from 1957-58, was unknown to this reviewer until it turned up in our unwanted screener pile. Because it starred cult actress Beverly Garland I was moderately curious to see it, only to discover that it's an unusual, even groundbreaking series of exceptional interest. For starters, it was the first - and still among the very few - American cop show with a female protagonist. One would imagine that, Decoy coming from the 1950s, that a male co-star would have been required to do all the heavy lifting, to sweep in and save the day, but such is not the case at all. In 1957, most television production was shifting to Hollywood, but Decoy was filmed entirely in New York City. Possibly owing to the fact that Garland was not quite a star, there are innumerable "stolen" shots of her filmed all over the city, from major landmarks to virtually unrecognizable boroughs, changed through decades of gentrification. Further, the series' guest stars included New York-based talent that in some cases would soon after begin long careers in Hollywood, or who would remain in New York and in the years that followed would generally appear only on the stage or in movies made there. Wikipedia claims the series was inspired by Jack Webb's Dragnet, a Top 10-rated show during 1951-56, but while its ratings might have inspired Decoy's production, the series itself bears little resemblance to Webb's. Decoy is a straightforward polcier, less fixated on the verisimilitude of police procedure and victim-witness-suspect interviewing than in little character portraits of the various victims and criminals. 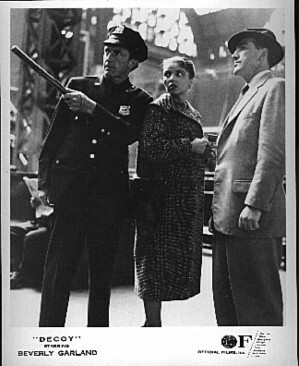 Garland plays undercover female police officer Casey Jones. (Like so many ‘50s titles, she has a man's name as well as a "man's" job.) It's not clear what her rank is, but she doesn't appear to be a sergeant or lieutenant (she's never addressed as such) nor does she appear to have the rank of detective. According to the DVD set's excellent booklet, New York policewomen weren't allowed to attend the Police Academy or take promotional exams until after Decoy left the airwaves. In the series, Casey doesn't have a regular partner (Frank Campanella and Simon Oakland are among those she works with) and she's assigned to different departments regularly. Like Dragnet episodes were based on actual cases, with the names changed "for obvious reasons" here vs. Dragnet's "to protect the innocent" (i.e., the show's producers, from being sued). The series was dedicated to the NYC Bureau of Policewomen / Policewoman's Endowment Association and retired NYPD detective Margaret Leonard served as the show's advisor. Active in films and TV from 1950, for most of the decade Garland appeared in low-budget fodder, often for director Roger Corman (including It Conquered the World, 1956). Decoy may have helped establish her as a reliable TV guest star. She occasionally did big films like Pretty Poison and Airport 1975, but is probably best known as Fred MacMurray's wife on the last three seasons of My Three Sons. Except to film fans, that is. In later years she became the hands-on owner of a sprawling Spanish-Mission style hotel in North Hollywood generally called the "Beverly Garland." It was there that Hollywood Collector Shows began turning up on a regular basis, with poster dealers and classical (and not-so-classical) movie and TV stars in attendance, signing stills and chatting with fans including - Garland herself. Until her death in 2008 she was a constant presence, often laughing over the cheap but strangely unforgettable movies she made in the early part of her career. As mentioned, Decoy's guest stars were a weighty list of talent, many at the beginnings of their careers themselves. Though it ran for just one season, the list includes Frank Sutton, Frank Overton, Joanne Linville, Colleen Dewhurst, Lois Nettleton, Clifton James, Diane Ladd, Barbara Barrie, Mason Adams, Ed Asner, Nick Colasanto, Albert Dekker, Suzanne Pleshette, Martin Balsam, Tomas Milian, Mike Kellin, Peter Falk, and Joe Silver. Distributor Film Chest is known primarily for public domain releases and, apparently, many episodes of Decoy fall into that category, but the episodes here are mostly in very good shape. Spread over three single-sided and region-free discs (in a DVD case that smells like an oil refinery), the discs are also closed-captioned. The booklet is a great extra, one that far bigger distributors could learn from. Its 14 pages include Historical Notes, Extended Synopsis (Synopses) with background on the show (as well as directors, casts, airdates, and locations utilized), a photo gallery of production shots and a trivia page. Good packaging, a great booklet, and a very above average show, Decoy is Highly Recommended.